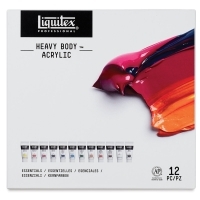 Liquitex Professional Heavy Body Acrylics are made to have an exceptionally smooth, thick, buttery consistency, ideal for traditional art techniques that employ brushes and painting knives, as well as experimental, mixed-media, collage, and printmaking applications. 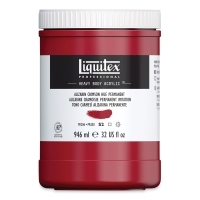 Liquitex Heavy Body Acrylics remain flexible when dry, and thick films remain free of cracks and chips over time. Liquitex also offers seven Cadmium-Free Colors — finally, an alternative to cadmium colors that measures up. This innovative line delivers the same performance, vibrancy, and lightfastness as genuine cadmiums, but without the potential hazards. These paints were developed over a three-year period and underwent rigorous lab tests and artist trials to ensure they were truly equivalent. 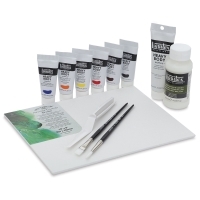 Cadmium-Free Heavy Body Acrylics are certified AP non-toxic. 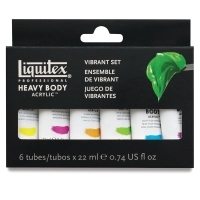 Vibrant Set of 6 — This bright six-pack includes Brilliant Purple, Cadmium Orange Hue, Light Blue Permanent, Medium Magenta, Vivid Lime Green, and Yellow Light Hansa in 0.75 oz tubes. 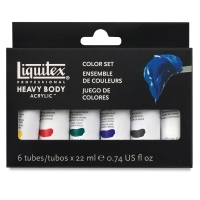 Color Set of 6 — This classic six-pack includes Cadmium Yellow Medium Hue, Mars Black, Naphthol Crimson, Phthalocyanine Green (Blue Shade), Titanium White, and Ultramarine Blue (Green Shade) in 0.75 oz tubes. 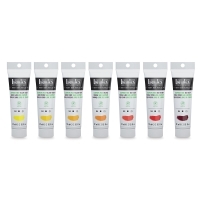 Studio 12-Tube Set — This set contains 12 colors in 2 oz tubes, including Quinacridone Magenta, Cadmium Red Light Hue, Dioxazine Purple, Ivory Black, Phthalo Blue (Green Shade), Phthalo Green (Blue Shade), Emerald Green, Bronze Yellow, Brilliant Blue, Cadmium Yellow Medium Hue, and 2 tubes of Titanium White. Essentials Set of 12 — This set contains 12, 0.74 oz tubes, including Yellow Medium Azo, Naphthol Red Light, Quinacridone Crimson, Dioxazine Purple, Ultramarine Blue (Red Shade), Cerulean Blue Hue, Phthalocyanine Green (Blue Shade), Yellow Oxide, Transparent Burnt Sienna, Transparent Raw Umber, Titanium White, and Ivory Black. 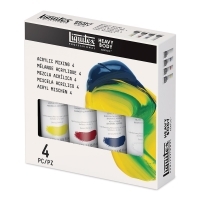 Primary Mix 4-tube Set — This set contains 4, 2 oz tubes, including Quinacridone Crimson, Yellow Medium Azo, Phthalo Blue (Green Shade), and Titanium White. 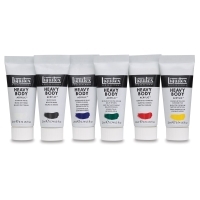 Studio 6-Tube Set — This set contains 6 colors in 2 oz tubes, including Cadmium Yellow Medium Hue, Naphthol Crimson, Ultramarine Blue (Green Shade), Phthalo Green (Blue Shade), Mars Black, and Titanium White. 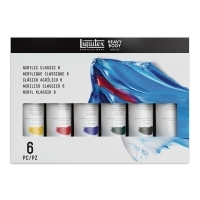 Primary Mix 6-tube Set — This set contains 6, 2 oz tubes, including Yellow Medium Azo, Quinacridone Crimson, Phthalo Blue (Green Shade), Transparent Mixing White, Ivory Black, and Titanium White. 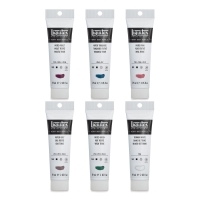 Muted Collection + White — This set contains six, 2 oz tubes, including Muted Violet, Muted Turquoise, Muted Pink, Muted Grey, Muted Green, and Titanium White. 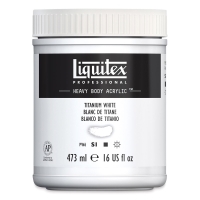 Liquitex developed its Heavy Body color line after their Soft Body colors (the first fine artist's acrylic sold commercially in the United States) were already well established. 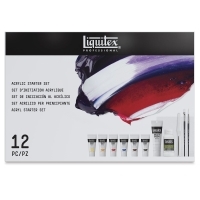 With the highest pure pigment load, Liquitex delivers improved opacity, permanency, lightfastness, and tinting strength. 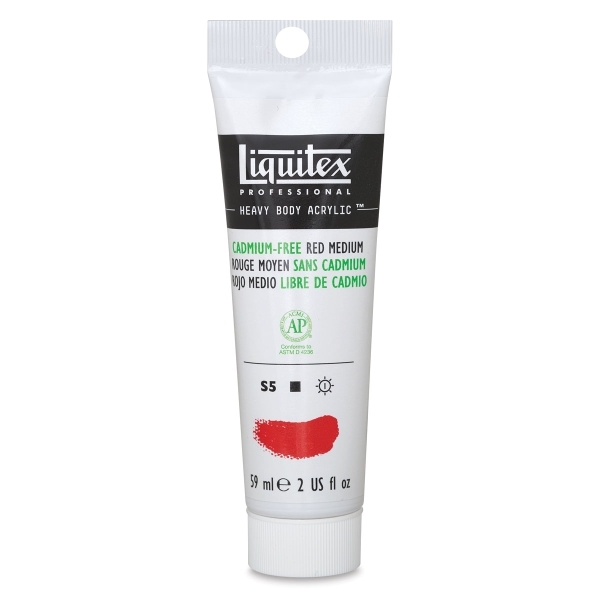 All lines of Liquitex acrylics have been formulated with a clear resin that brings out the maximum brilliance and clarity of each pigment. Colors dry without becoming milky or significantly darker. Paints are flexible when dry to allow built up surfaces to remain free from cracks and chips, one of the many characteristics that makes them ideal for impasto techniques. All colors are formulated to dry within a tight satin sheen range. This reduces the problem of colors drying with different surface sheens (i.e. gloss, satin, matte, etc.) depending on pigment type. It enhances the visual clarity of the finished painting and eliminates unwanted glare spots. Colors are resistant to ultra-violet light. The paints are less sticky when wet, for smoother blending and brushstrokes, and less tacky when dry, even in humid weather. Drying time has been extended 20% for easier blending and longer "open" time. 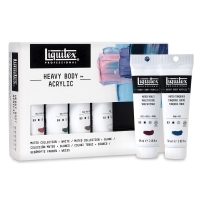 Liquitex Heavy Body Acrylics allow greater versatility of technique compared to other media, making them America's #1 choice for brush or knife painting, mixed media, printmaking, and collage. 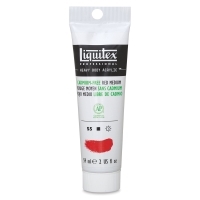 Liquitex colors have little odor, are nonflammable, and produce no fumes. They use non-toxic thinners and mediums. Do not mix with turpentine or oil paints. 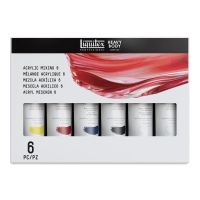 Mix only with other acrylic emulsion paints or mediums. 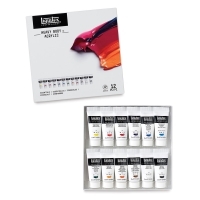 Liquitex acrylic colors come in three distinct viscosities; Soft Body, Heavy Body, and Ink. Each contain high levels of pigment for intense color and great coverage. Whatever your creative endeavor or application, there is a Liquitex Acrylic paint that will meet your needs.